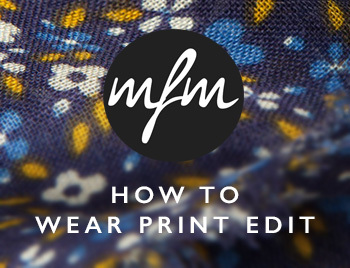 The secret to wearing print well is fundamentally wearing print with confidence. It is the idea of using print as the stand-out statement piece of your outfit like the Oakington Parka or the Beige Cheetah Laced Driver and owning the look. Another form of wearing print is accessorising your outfit where is necessary for a complementing and stylish addition. The Floral Scarf is the perfect print accessory to elevate an outfit to a higher order. Containment with a solid outerwear piece is a tip for those who aren't as bold about displaying print so openly. By using the Addison Black Leather Biker or the Stone Canvas Lennon Jacket you can contain such bold prints as the LS Vintage Paisley Shirt and the LS Camo Green Print Shirt. Combining a check and a paisley is quite a bold statement but with this outfit combination it works to perfection. 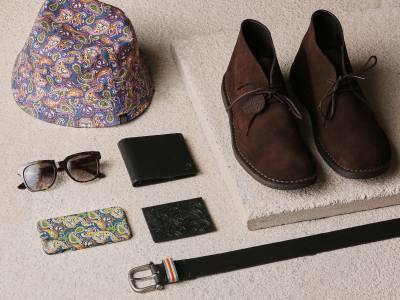 The subtle check on the brown marker coat complements and contains the vibrant paisley. To finish the outfit we've gone for black on black for the bottom half with the black tapered jean and heisenberg boot. 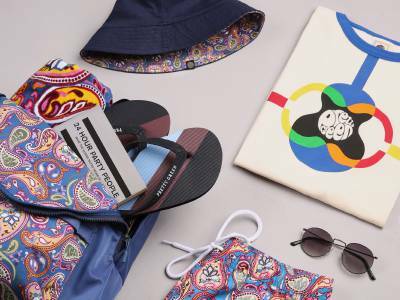 This look is perfect for the summer built around a light and soft colour palette with the example of accessorising with print in the form of the PG print bucket hat. The bucket hat is in a bold blue camo print but if you aren't feeling so brave you can opt to reverse to a solid navy. Again we have worked two prints into an outfit with the floral scarf and chetah print driver. It helps that the floral is fairly subdued compared to the stand out beige chetah print which certainly epito-mises a statement shoe. You also cant fail to recognise the beautiful addison leather jacket which brings some necessary understated class to proceedings. Confidence is key when wearing print and you certainly need that element to carry off the watfield harrington jacket with its green camo print. We have teamed a discreet geo print grandad tee for added detail and the red driver to really confirm stylish confidence. Subtlety isn't always associated with print but with this look it certainly is. The stone Lennon jacket is containing but also complementing the tennyson floral shirt. The traditional penny collar on the tennyson shirt helps to define a sharp but understated look.